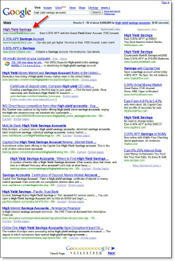 Yesterday, a new advertiser appeared at the top of Google searches for "high-yield savings accounts (click on inset for closeup)," Apple Bank for Savings <theapplebank.com>. The New York-based thrift is marketing the 5.25% APY account under the brand name, Grand Yield Direct <grandyielddirect.com>. 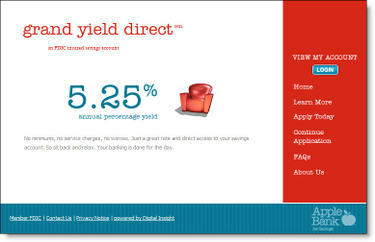 To market the account, the bank uses a single-product microsite powered by Digital Insight (see screenshot below). The Apple Bank name and logo appear in the lower-right corner in a subtle graphic image, but there are no links back to the main bank site. The online application is hosted by CashEdge (click on continuation link for screenshot). The new product joins an increasingly crowded field that just two years ago was owned by ING Direct. Just yesterday, E-Loan launched its 5.5% savings account (see FMW 26 Sep). Online Banking Report: Latest Trends in the Internet Banking Industry. Is the United States Overbranched?